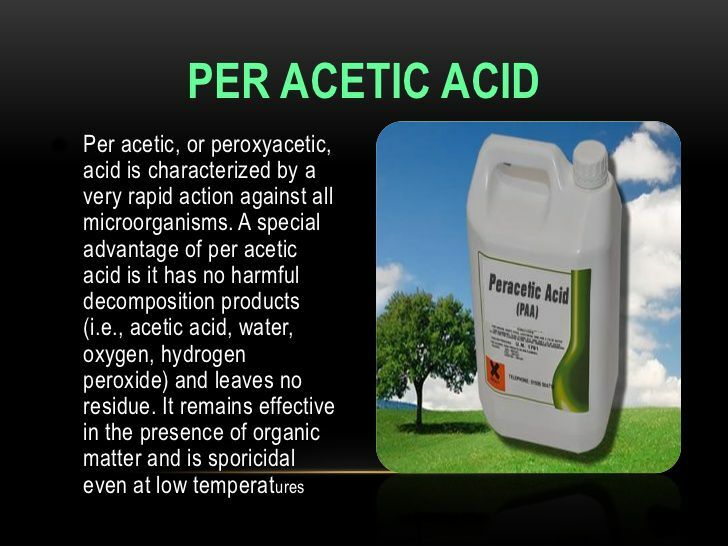 Description : Peracetic acid (PAA) is a highly effective biocide, used in a wide range of applications. Its uses are continually increasing as standards for disinfection and environmental legislation become more demanding. Peracetic Acid is a liquid sanitizer for the food and beverage industry. Its no-rinse, non-foaming formula and its ability to sanitize at cold temperatures makes it ideally suited for use in circulation (CIP) clean-in-place systems for food processing equipment. Peroxyacetic acid liquid sanitizer is also approved for immersion cleaning of equipment and utensils for food processing and packaging plants and eating establishments. It matches the performance of other Peracetic acid based sanitizers (such as Divosan Activ of Johnson Diversey and P3 Oxonia Active of Ecolab). Application : Peracetic acid is highly oxidizing in nature and is experiencing rapid growth for a wide variety of applications other than in food and beverage industry such as. breweries, wineries, beverage and food processing/ packaging plants and egg processing and packaging equipment surfaces. The dosage depends on applications, ranging from 0.5% to 5% v/v. The specific dosage rates and method will be specified by the CSL technical representative. Does not require multi-biocides as micro-organisms cannot produce immunity.